To celebrate the Federal Trade Commission’s 14th annual National Consumer Protection Week (NCPW), Identity Theft 911, the nation’s premier identity management and data risk management services provider, provides information to help consumers protect their PII. “When people think of identity theft, they tend to primarily focus on the financial impact,” said Adam Levin, co-founder of Credit.com & Identity Theft 911. In recognition of the Federal Trade Commission’s 14th annual National Consumer Protection Week (NCPW), Identity Theft 911, the nation’s premier identity and data risk management services provider, has created an article entitled “The Recipe for a Safer Identity is as Easy as PII,” an imaginative look at how to protect personally identifiable information—or PII. Over the past few years, the definition of PII has significantly evolved beyond Social Security numbers, birthdays and mothers’ maiden names to include, among other data, email addresses, passwords and PINs. 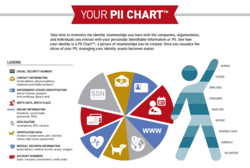 The piece features a unique PII ChartTM, that graphically shows the myriad ways that consumers are vulnerable, along with valuable tips to help them safeguard privacy and avoid identity theft, fraud and scams. "The Federal government has defined PII and created laws specifically to protect a consumer’s sensitive information," said Matt Cullina, chief executive officer of Identity Theft 911. "However, we often neglect to keep track of the variety of everyday risks to our PII, as well as the multiple exposure points that expose us to identity theft and fraud. This recipe helps make it 'easy as pie' to do just that." Within the simple recipe are practical pointers and advice to help consumers sort the many identity relationships they've created and separate those relationships from each other. There are also simple, no-nonsense suggestions on how to reduce the risk of identity theft and keep thieves away from confidential data. Founded in 2003, Identity Theft 911 is the nation’s premier consultative provider of identity and data risk management, resolution and education services. The company serves 13 million households across the country and provides fraud solutions for a range of organizations, including Fortune 500 companies, the country’s largest insurance companies, corporate benefit providers, banks and credit unions and membership organizations. Since 2005, the company has helped more than 150,000 businesses manage data breaches. For more information, please visit http://www.idt911.com, http://www.facebook.com/idt911 and http://www.twitter.com/idt911.